Breakthroughs in diagnosis, surgery and in-office treatments are transforming the nature of orthopedics and sports medicine. Unlike a traditional knee replacement, the new technique does not require that the quadriceps tendon be cut, thereby significantly reducing recovery time and pain. In fact, Giordano was discharged from the hospital the day of his operation. Recent technological breakthroughs are reducing the invasiveness of a host of treatments related to sports medicine and orthopedics, and making the downtimes associated with them shorter than ever before. These range from improved diagnostic aids that catch problems sooner, to increasingly refined surgical techniques that improve outcomes and reduce risk. It’s official: A new era of orthopedics has arrived. That starts with improved imaging tools, including a new high-field 3.0T MRI machine that is better equipped than a standard MRI to identify issues within the body’s smaller structures. With a magnetic field twice as strong as the standard MRI, “It really helps with hands, wrists, feet and toes, where all the muscle, ligaments and tendons are very small. In the past we were never able to visually see them in the pictures; they were too fuzzy,” says Dr. Gregory Goodworth, director of body imaging at South Jersey Radiology. Along with improved diagnostic tools, there are also improved treatments. Many local surgeons rely increasingly on arthro?scopy to treat torn cartilage, ligament injuries, rotator cuff injuries and more. This technique relies on the insertion of a fiber optic telescope with a video camera into a small incision, so doctors can see the problem up close and in high definition. Instruments are then passed through the incision to fix the problem. Dr. John Mariani, an orthopedic surgeon at Kennedy University Hospital, says that with arthroscopic surgeries, “there is much less damage to the soft tissue.” He notes that improved surgical knowledge and advances in technology have refined arthroscopic procedures even further in recent decades. Dr. Russell Huffman, orthopedic surgeon at Penn Medicine, notes that the operating method can be especially beneficial in shoulder procedures. For patients who have fractured their collarbone or torn the ligament that holds the collarbone in place, arthroscopic surgery can be used to reconstruct the ligament. The procedure allows the doctor to place the ligament precisely and have a direct view of the work. “There’s not as much surgical dissection, so the immediate post-op pain is less,” Huffman says. Another breakthrough is the advent of the reverse shoulder replacement, which can restore the full range of motion for people who were previously all but untreatable. For patients with severe shoulder arthritis compounded by irreparable rotator cuff injuries, Dr. Ray Ropiak of Reconstructive Orthopedics in Marlton and Mount Holly completely reconfigures their shoulders, by reversing the position of the ball and socket. “More of what I feel that I deal with are injuries that are accumulated over time, and it is just one smaller accident that pushes them over the edge,” says Ropiak. Although the recovery time associated with a reverse shoulder replacement is about three to six months, patients require little physical therapy. And even without a working rotator cuff, patients regain full range of motion—something that could not be achieved for such patients through a traditional shoulder replacement. In-office procedures are also in?creas?ingly prevalent, notes Dr. Craig Kimmel of Lourdes Medical Associates Primary Care Sports Medicine. With a focus on biomechanics, he helps patients figure out how they got injured and how to prevent it from happening again. Using a musculoskeletal ultrasound, he observes as a patient conducts the motion that causes pain, and pinpoints the problem. Then, an ultrasound-guided injection into the exact area of pain is used to draw out calcium, fluid or whatever the problem may be. The musculoskeletal ultrasound has come into sports medicine within the past five years. “Before the ultrasound, in terms of injections, we knew by history and experience where the problems typically were and knew the basic boundaries of where the injection should go,” says Kimmel. Now, doctors can see the exact point of pain. This procedure also costs several thousand dollars less than a MRI. These experts offer solutions to muscle and bone injuries of all types. Academy Orthopaedic offers board-certified surgeons providing everything from joint replacements to arthroscopic surgery, and has been serving South Jersey communities for over 30 years. They’re large enough to serve you, small enough to know you. Dr. Orin Atlas, a fellowship-trained orthopedic surgeon, specializes in all aspects of spinal care and reconstruction, including complex revision surgery. He treats spinal disorders through both non-operative and operative management of spinal disorders. 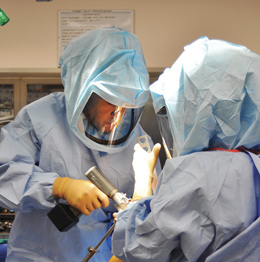 From sports injuries—like twisted ankles and torn ACLs—to knee problems caused by overuse or osteoarthritis, Kennedy’s team of board-certified orthopedic surgeons, including members of the Rothman Institute, perform various surgical procedures at Kennedy’s three hospitals and its outpatient Surgical Center. Follow-up care is offered at their physical therapy departments. Kennedy’s Orthopedic Program Coordinator works with joint replacement patients prior to surgery to provide educational information to help ensure a positive outcome. Lourdes Medical Associates is a professional association of primary care and specialty physicians integrated into a healthcare network of hospital and outpatient services. LMA is dedicated to serving patients seeking high quality, compassionate and affordable care close to home. Through the advent of current technology, physicians are now able to prevent more surgeries than ever. Many cases of rotator cuff tendonitis, knee pain and back pain can be treated with platelet rich plasma (PRP), stem cells and other regenerative medicine techniques like prolotherapy. A leading provider of Comprehensive Acute Rehabilitation, serving those recovering from multiple trauma, orthopedic surgery, amputation, hip fracture, arthritis and pain. Recovering from orthopedic surgery can require professionals that are well versed in the individual needs and requirements of orthopedic procedures. The aim of the rehabilitation therapy sessions is to provide the patient with enough range of movement and strength to be able to complete tasks independently and return them to their highest level of independence. Advancement of high-field 3T MRI imaging and specific body part coils has been very useful in the evaluation of athletes and others with injuries and pain. SJRA’s 3T MRI, in conjunction with dedicated coils, now allows for highly detailed, high- resolution imaging of very small structures such as ligaments, tendons, cartilage, labrum and growth plates as small as one millimeter.